Please register directly with each presenter unless otherwise noted. Drop-ins welcome so long as space is available. Please register below to secure your spot. Payments can be made online when you register or by check (payable to Yoga Loft) at the workshop. 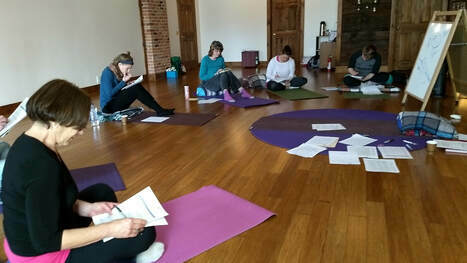 Come, be guided in the practice of iRest Yoga Nidra, deep relaxing meditative self-inquiry, to connect with your inherent ground of health and wholeness. Yoga Nidra is an ancient tool for cultivating awareness and iRest (Integrative Restoration) is a retooled style for modern times. In this session, you are invited to bask in The Mystery of pure being. Yoga Nidra practice aims you towards unification of body and mind with spirit. Then bathe in the sounds, vibrations and frequencies created by Tibetan and crystal singing bowls, chimes, turtle drum, shruti box and more. Your attention will flow to these mystifying sounds, brainwave states slow down, and your nervous system relaxes - in such a state, natural healing can occur and insights can arise. It is a very creative state of being.